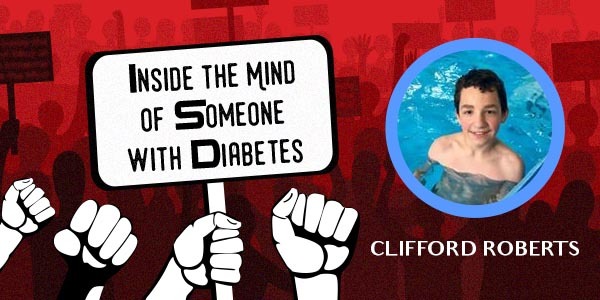 We’re going to discuss today what it’s like to have Type 1 diabetes as a 12-year-old from the viewpoint of Clifford Roberts. Clifford is an active 7th grader who enjoys sports, video games and hanging out with his friends. Thank you Clifford for agreeing to participate in this interview. I believe it will be wonderfully beneficial to our readers to learn more about living with a chronic illness. First off, what type of diabetes do you have? We have readers with all types, so it’s important to talk about this first. I have Type 1 diabetes. Type 1 diabetes is an autoimmune disease. How were you made aware that you had diabetes? Please share your diagnosis story with our readers. I was 6 years old. I was at my dad’s and I was feeling awfully sick. My dad took me into the hospital. Then I had to be lifeflighted to Children’s Hospital in Pittsburgh. A few days later they said I had Type 1 diabetes. I wasn’t really sure what that meant at the time. My mom said I was unconscious for at least a day before waking up to find out I had to have 6 shots a day now, all the time. The idea of that was pretty scary for me. We’re all curious, even if we live the life, everyone is different, what is a typical day like for you? I have to get up and test my blood sugar, figure out what I want to eat for breakfast. Once I figure out the meal, I have to find out how many carbohydrates are in it, so that I can properly give the right amount insulin (bolus) for the meal. I’m in 7th grade now, so my lifestyle is pretty active. I go to school and at lunch I have to do the same thing all over again, test and bolus. If there is any time that I feel high or low, I must go to the nurse and test and give myself insulin with my insulin pump accordingly if I am high, or treat my low blood sugar with a juice box and glucose tablets. If I am low I have to stay out of class to wait to be retested to make sure I’m within a safe range to go back to class. At the end of the day I have to visit the nurse again to test my blood sugar and again give insulin if I am high, but I need to make sure that I am careful about how much insulin I give because I walk home from school. My pump allows me to increase or decrease my basal rate depending on if I’m higher or lower and to account for the increased activity of walking home from school. I have to try my best to ensure I’m within a safe range afterschool and after dinner to ensure I can participate in soccer practice. At soccer practice I must test my blood sugar before beginning, during if I’m feeling high or low, and after practice is over to ensure that I am within a safe range. Describe the one scariest moment since your diagnosis. I cannot really describe the scariest moment because I was only 6 years old. But I remember feeling not quite right one day when I was playing with my brothers and sisters. I told my mom and she helped me test my blood sugar. I remember that I was only 135, but mom kept looking at me strange and told me to come downstairs and sit with her and my stepdad in the living room. I wasn’t sure why, because she kept telling me I wasn’t in trouble but she just wanted to keep an eye on me. Little did I know that is the moment that could have saved my life. All I remember after that is waking up in a hospital bed and seeing doctors and nurses holding me down. I screamed for my mom and I saw her run into the room and jump over the other bed to get to me. I found out that I had had a seizure and had to go to Children’s hospital. This is when we learned that my sliding scale was not working right for me and my dose was way too high. I’m very happy that my mom had thought something was wrong and had me sit with them otherwise who knows what would have happened. Living with a chronic illness can be overwhelming, how do you cope with the constant battle of trying to maintain a proper balance with your blood sugars? I stay positive, I don’t really tend to get stressed about my blood sugars right now. My mom always taught me, alright it’s a high blood sugar so let’s bolus and move on. If you could give one tip to someone newly diagnosed what would it be? I do not recommend the sliding scale. It was very difficult to properly ensure I was receiving the right amount of insulin and using this scale resulted in two very scary emergency situations. What is the most challenging aspect to you, in living with diabetes? The most challenging aspect to me seems to be not being able to participate in all activities whenever I want to. If my blood sugar is too high or too low I must handle that first before participating and this often leads to me missing out on some things. How often do you have to test your glucose levels? I test 10-12 times a day. When I am sick it can be upwards of 20 times a day as it’s important to keep an eye on my blood sugar. What insulins have you used or do you currently use? Novolog is what I currently use with my T-slim insulin pump. However, when I was on shots, I started on Humalog and Lantus. What would you like people who have diabetes to know? To always stay positive and upbeat, to never let diabetes win. Who do you get support from? Who treats you? My parents are my support system. I also have a new friend who carries a juice box for me in his backpack when we are walking home. This helped me tremendously the other day when I felt low and realized I left my diabetes bag at home that morning. Let’s conclude on a positive note. I know it can be difficult to find the light at the end of the tunnel, but if you thought really hard, what is one positive thing that diabetes has brought to your life? It makes me closer to my parents.